Shefko's Drawstring Yard Tarp 8.2 X 8.2 The Tarp with a built-in rope! The most convenient and versatile tarp you will ever use - By utilizing the built-in rope design, Shefko's Yard Tarp is a handy tool for collective leaves and other types of lawn debris. The yard tarp forms into an instant bag - Simply, collect all the leaves onto the yard tarp, and then cinch it up. Now it can be dragged from one place to another. Ideal Cover - The Yard tarp is also ideal for covering BBQ grills, lawn mowers, patio furniture and other outdoor equipment. You will never have to struggle with ropes or elastic cords ever again - Using the built-in rope as a drawstring and tie down, the yard tarp will make yard work fast and easy. UV treated for extended outdoor use. Ideal application for: yard clean up, patio furniture cover, Barbeque grill cover, motorcycle cover, machinery cover, comport bag, recyclable storing bag and MORE. PLEASE NOTE: UNTIL SEPTEMBER 2018, TARPS ARE IN BLACK, NOT GREEN. Shefko's Drawstring Yard Tarp - The Tarp with a built-in rope! 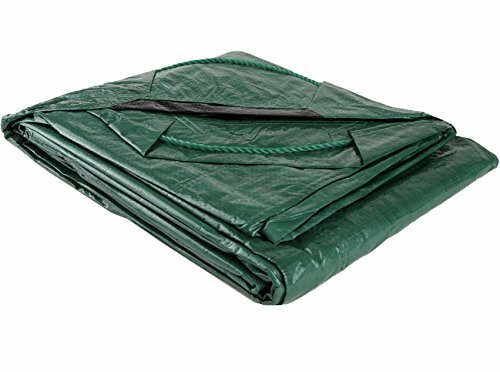 Ideal Cover - The Yard tarp is also ideal for covering BBQ grills, lawn mowers, patio furniture and other outdoor equipment. You will never have to struggle with ropes or elastic cords ever again - Using the built-in rope as a drawstring and tie down, the yard tarp will make yard work fast and easy. Heavy duty poly fabric. UV treated for extended outdoor use. Bolted polypropylene rope handles. Reinforced corner stitching. Mildew and rot proof. Washable. Ideal application for: yard clean up, patio furniture cover, Barbeque grill cover, motorcycle cover, machinery cover, comport bag, recyclable storing bag and MORE. If you have any questions about this product by Shefko, contact us by completing and submitting the form below. If you are looking for a specif part number, please include it with your message.